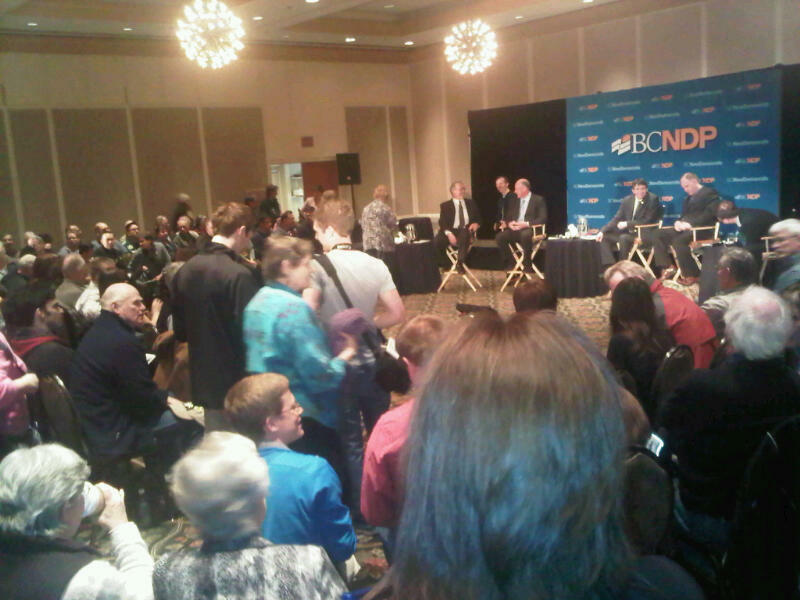 Crowd gets set for NDP leadership debate in Kelowna on Monday, March 21, 2011. The NDP leadership debate in Kelowna Monday night ended up being something of a love-in. The candidates were articulate and thoughtful, treated one another with respect and basically didn’t disagree with each other at all. Sure, former Marijuana Party leader Dana Larsen, outlined a socialist vision for B.C. – re-nationalizing B.C. Rail, taking back control of B.C. Ferries, putting natural resources under community control, free public transit, big increases in social services like mental health supports and housing and much higher corporate taxes to pay for it all. Pretty provocative stuff that would scare the bejeesus out of the business community should this actually became official NDP policy. But none of the other candidates took exception with the vision, though none of them endorsed it either. In fact, they didn’t even acknowledge it at all and that was really the problem with the debate. When candidates did bother to refer to each others positions, it was only to concur with them and pat one another on the back for being so enlightened. Any disagreements were simply ignored. One thing the debate did appear to do was energize the party’s base in Kelowna. Approximately 150 people showed up. As is typical here for political events, most people appeared to be middle aged or older, though there was a noticeable smattering of young people in the crowd. Most attendees seemed to enjoy hearing the candidates espouse positions that resonated with their beliefs and the candidates were rewarded with a standing ovation at the end of it all. But for those who aren’t already NDP die-hards, Monday evening’s proceedings wouldn’t have been all that compelling. What would I have liked to see? First, I would have liked the other candidates to address Larsen’s socialist vision and say whether they reject it, support it or like it but think it’s totally unrealistic. The party used to be socialist, so where does it stand on socialism today? The NDP is having this leadership race because of a crisis. Carole James espoused a middle-of-the road, curry favour with business approach and as a result was forced out in a coup that split the party. Clearly there are difference in the party about what it should stand for and what vision for B.C. it should put forward. Why are those differences not being hashed out in this leadership contest? Personally, I think a few fireworks could go a long way to resolving long standing tensions in the party and would give the party’s leadership race some much needed media attention. Fireworks would also give British Columbians a reason to turn away from Christy Clark’s mesmerizing smile and pay a bit of attention to the NDP.